Beets, Beats and Better Bites with tasty treats, DJ tracks and dozens of tractors rumbling through the streets! 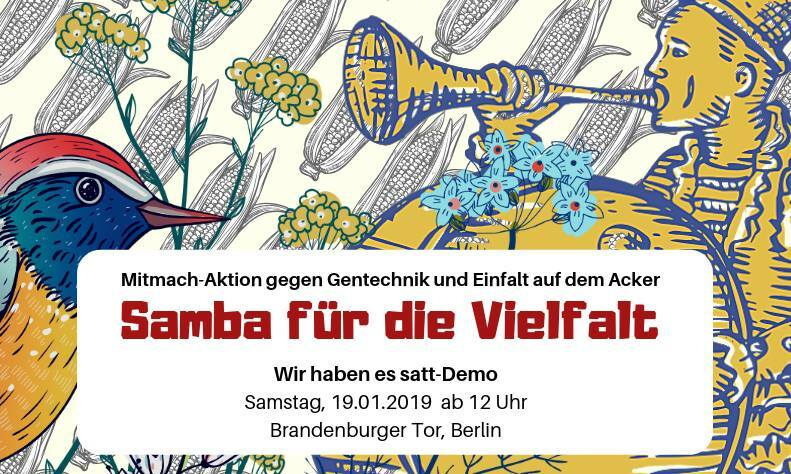 What it’s the annual Wir Haben Es Satt (#WHES19) mobilization in Berlin. 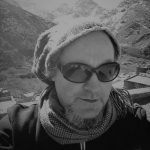 What’s happening – and why? 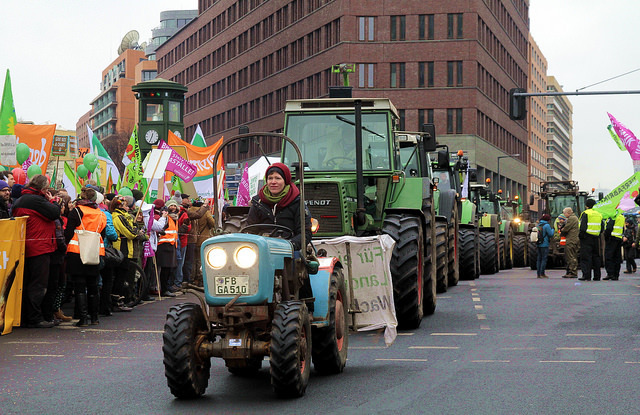 Eating is Political – we are fed up with agro industry – Good food, climate-friendly agriculture and the preservation of farms – These are just some of the slogans for 2019’s Wir Haben es Satt rally. 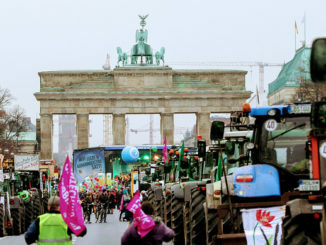 Timed to coincide with Germany’s agricultural trade show, Green Week, this event draws huge numbers – tens of thousands – to the capital to protest and also to celebrate a different way to do food. Dozens of small farmer, organic, environmental and animal welfare organisations have come together once again to support the event. 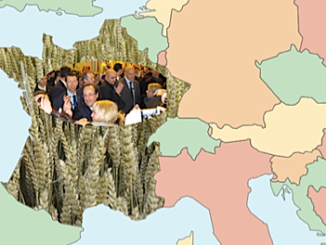 There is renewed emphasis on AU ag policy – CAP the Common Agricultural Policy – and the poor choices of spending EU money – choices that support business-as-usual. The demo this year emphasises the unfairness of large landowners getting the lion’s share of the money. Instead spending the German government will play a decisive role in the EU agricultural reform (GAP) by deciding which agriculture the EU will support with 60 billion euros each year. Those who own a lot of land get a lot of money. So stop paying billions in taxes to the agricultural industry! The conversion to a more rural and ecological agriculture can no longer wait, organisers say. 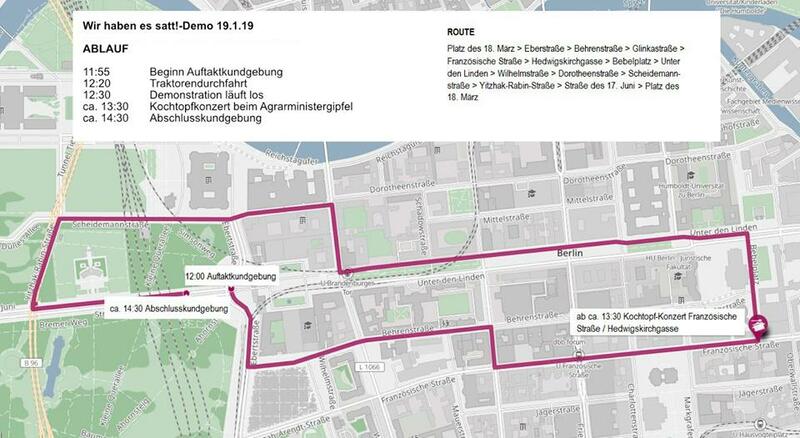 See below for the route for Saturday’s event, Which starts just before noon Saturday 19th January. On tonight Friday from 6PM, this is a food party – and so much more. At this fun event, people gather to make props, listen to talks, dance and, most importantly, turn a lot of vegetables into a big big cauldron of soup for after the demo. 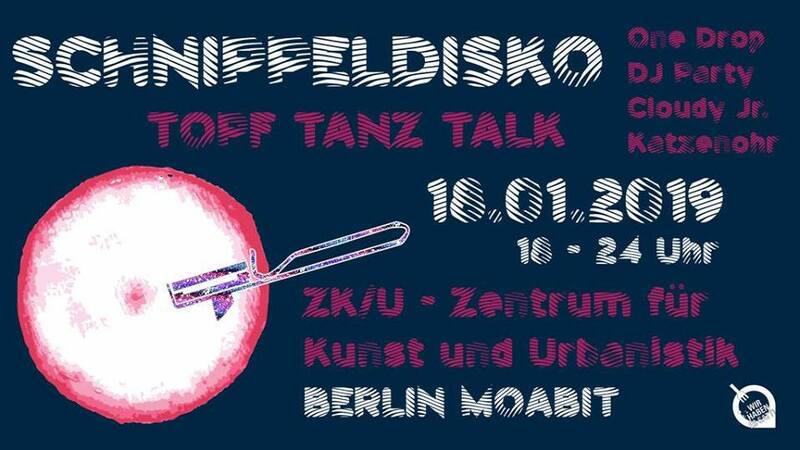 “Welcome to the world’s largest Disco Soup on January 18th, 2019, in Berlin! 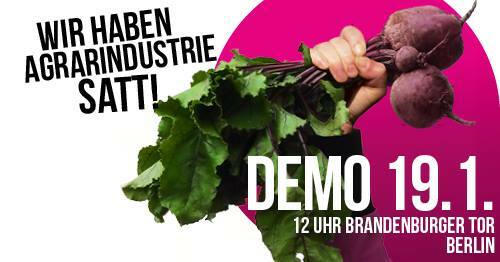 Lets heat the dancefloor and the veggies and get ready for the „We are fed up“-demonstration (Wir haben Agrarindustrie satt!-Demo) on January 19th. Sharp knives and discussions, great beats and beets are amongst the ingredients of the most unusual disco you‘ve ever experienced. Too small, too big, too fat, too thin for the standardized wholesale and retail norms: 1500 kg vegetables from Brandenburg region‘s farmers will be waiting to be chopped and transformed into a delicious vegan soup by the „Fläming Kitchen“ Team! Want to give your hands and feet a break? Be creative and help create costumes and banners for the demonstration, get involved in one of the many interactive Workshops or get inspired with the talks from great activists from all around europe. Facebook event with directions and more! We’ve been going a long time to this fun party- here’s what we wrote about it in 2014! With a Samba street dance theatre, this event uses art performance and music to tell a story about diversity – to emphasise that you can sow variety instead of simplicity on the field. 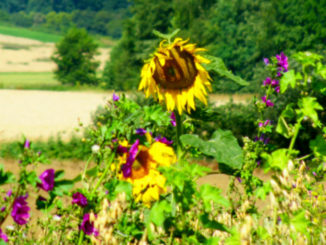 “Disguised as arable crops, flowers, insects and birds, we dance – supported by groovy samba beats – to drive away the desolation and hostility of (genetic engineering) monoculture from the field, driven by mega-seed and chemical companies such as BaySanto.”Expect costumes, dancing and an important story told about gene drives. See event’s facebook page and, you can get involved in ‘action tailoring’ the screen printing and sewing workshop – at the Schnippeldisko tonight – Friday! 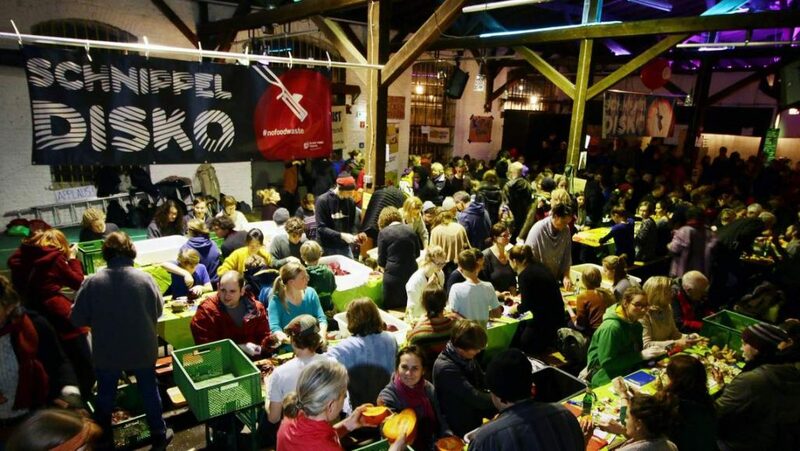 After the demo Saturday, people gather at the Heinrich-Böll-Foundation to hear about agri-food issues and inspiring initiatives from all over Germany and also further afield. 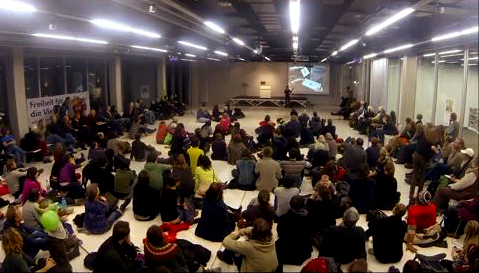 This “soup and talk” is where people consume the disco soup made at the Schnippeldisko, while talking about, or listening to, five minute presentations delivered with just five slides. All the details of presenters and topics are here and include our own Helene Schulze talking about our Letters from a Farm series.